You have just gone through a long review of all your business processes. You studied them with flowcharts and analyzed them against standards. You've optimized your processes and made them leaner, faster, smarter, more responsive. You are ready to deploy them throughout your enterprise. There is a simple secret that will guarantee a successful implementation. Ignorance of this secret nearly always guarantees failure. What is this compelling and mystical secret that guarantees success? Write clear, useable documentation. If the manual for the new processes looks like a telephone book and reads like poorly translated stereo instructions there is a significant problem waiting ahead. If the manuals read like something out of the United States Air Force Academy, chances are not a single soul in your company will read the document. 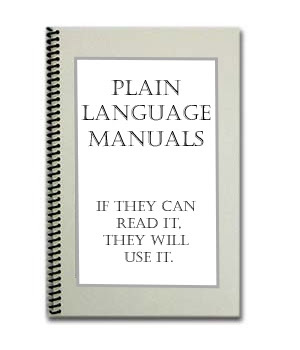 If it uses technical jargon and other such gibberish it will not be read by anyone. An unread manual is a waste of money and paper. Documentation needs to be easily understood by anyone regardless of technical ability. It needs to be a set of simple, standardized instructions. It needs to have a great index and large tabs on the side to quickly take you between sections. A good user manual will give your employees a clear description of the actual steps they need to perform in every one of their job functions. It needs to give them a number of steps to follow that includes lots of pictures. To make it a great user manual, you'll make sure it has a spiral binding so it can lay flat. And it needs to also be available on the company intranet too. To make it cheaper to print, don't give everyone the whole company manual, just the portions that apply to their job. If you take the time to develop a useable manual for your staff, they will actually use it! This will ensure a smoother transition to your newly optimized processes. Don't let your company crash to a halt because of poorly written instructions. Spend the money and get a good manual written. Insist on it and you will save yourself lots of headaches. For a documentation sample: How To Clean & Optimize Your PC in PDF format. Contact us to discuss your manual writing project.